JUNE 22, 2016, SEATTLE, WA – Uptime Institute, the globally recognized data center authority, today announced the results of the 2016 Uptime Institute Data Center Industry Survey. The sixth annual survey provides an overview of the major trends shaping IT infrastructure delivery and strategy. According to survey findings, 50% of senior enterprise IT executives expect the majority of IT workloads to reside off-premise in cloud or colocation sites in the future. Of those respondents 70% expect that shift to occur by 2020, and 23% expect the shift will happen by next year. Uptime Institute Survey findings since 2013 have shown that the majority of respondents report some percentage of their IT portfolio resides outside of their enterprise-owned data centers, either in the cloud or some form of off-premise computing. But the annual Data Center Industry Survey takes the pulse of the legacy, on-premise enterprise IT and data center operations teams, many of which are not motivated or inclined to move to cloud. Previous results likely underrepresented the shift to cloud computing, as business units deployed in the cloud without IT Operations or Data Center personnel involvement. IT as a whole needs to move away from its current role as a slow-moving centralized provider, and instead direct corporate governance across the various business lines – evaluating security, costs, and performance of IT for the business. Additionally, legacy enterprise IT groups need to develop clearer messages to the business to articulate their value and efficacy. Many legacy enterprise IT departments are shrinking, due to budget pressures, IT hardware advances and the outsourcing of workloads to cloud and colocation providers. For the last five years, approximately 50% of enterprise IT departments have reported flat or shrinking of overall budgets (combined spend for on-premise technology infrastructure of IT and data center facilities). This figure has remained steady in each Uptime Institute survey. Some enterprise IT organizations are receiving modest budget increases, but fewer than 10% are realizing significant growth. Colocation providers had experienced tremendous growth in the last 5 years, but shrinking enterprise IT deployments are now impacting capital project cycles across the board. Enterprise organizations paying a premium for a 3rd party to deliver data center capacity should hold service providers to higher standards. There is room for improvement in vetting, negotiating and managing those relationships. The Uptime Institute survey findings show that competition from service providers threatens the relevance or very existence of enterprise IT teams. Leading enterprise IT organizations will be most successful by driving efficiency and transparency in their own assets, and providing corporate governance over security, costs, efficiency and performance of Service Providers for end users. The sixth annual Uptime Institute Data Center Industry Survey was conducted via email in February, 2016 and includes global responses from over 1,000 data center operators and IT practitioners. Uptime Institute is an unbiased advisory organization focused on improving the performance, efficiency, and reliability of business critical infrastructure through innovation, collaboration, and independent certifications. Uptime Institute serves all stakeholders responsible for IT service availability through industry leading standards, education, peer-to-peer networking, consulting, and award programs delivered to enterprise organizations and third-party operators, manufacturers, and service providers. 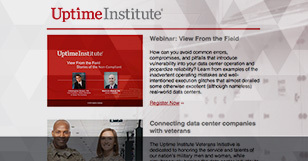 Uptime Institute is recognized globally for the creation and administration of the Tier Standards & Certifications for Data Center Design, Construction, and Operational Sustainability (now over 700 certifications globally) along with its Management & Operations reviews, FORCSS® methodology, and Efficient IT Stamp of Approval.